Q: Are plans included in Parts Sets? Parts sets do not include either plans or accessories. Our primary product is Parts cutting and many of our customers have already purchased the plan to study and evaluate. For customers requiring a complete package we are able, for most designs, to offer plans and accessories. These are listed as links to the main Parts Set for that design. Q: Can you cut a parts kit from my plan? Sorry, we do not cut parts one off designs from paper plans, but we can cut parts from your own CAD data. See downlaod section for more details on what is required. However, we are open to suggestions for Vintage designs that can be added to our list of Vintage parts sets. 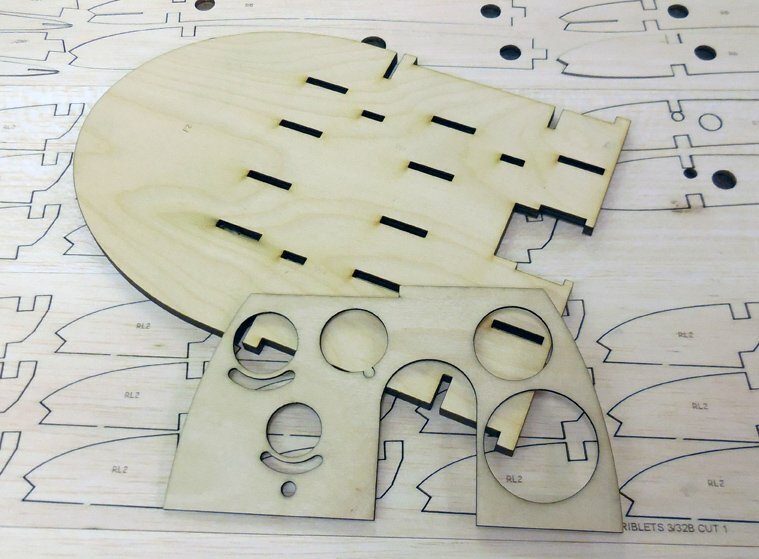 Laser cut parts have a slight surface discoloration caused by the vaporisation of material as the laser cuts. This surface can be removed by light sanding or left. 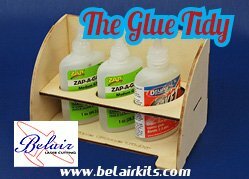 It does not affect the effectiveness of the glue bond and you can continue to use your favourite adhesives with confidence. Our customers have used cyano, aliphatic & standard PVA, balsa cement and epoxies and foaming polyurethane adhesives with good success. This is a great way of supplying parts for cutting. We accept all file types ending with .dwg and .dxf, even Illustrator and Corel Draw files. Alternatively supply us with an Autocad file. When you create your parts in a CAD package you have complete control and can nest the parts in the most wood efficient way possible, thereby reducing your cutting bill. Please ensure that all line widths are hairline or less in width and that all shapes are created as polylines - please call if unsure. For a helpful guide to preparing parts for cutting, please go to the download sections on the top menu. Q: In addition to a Parts Set, what else do I need to buy to build my model? Your Belair Parts Set saves you hours of labour and allows you to start building straightaway, however you will need to purchase a plan and accessories such as cowl, canopy and retracts. Some customers have already purchased the plan and accessories directly from the designer/publisher and just use us for the Parts Set, others find it convenient to purchase all items from us. Many purchase the Plan and Parts Set initially and schedule delivery of accessories as they are required - after all, these models take a while to build, so why have expensive accessories collecting dust on your workshop shelf. Q: What can laser cutting do? Let us first tell you what laser cutting won't do! 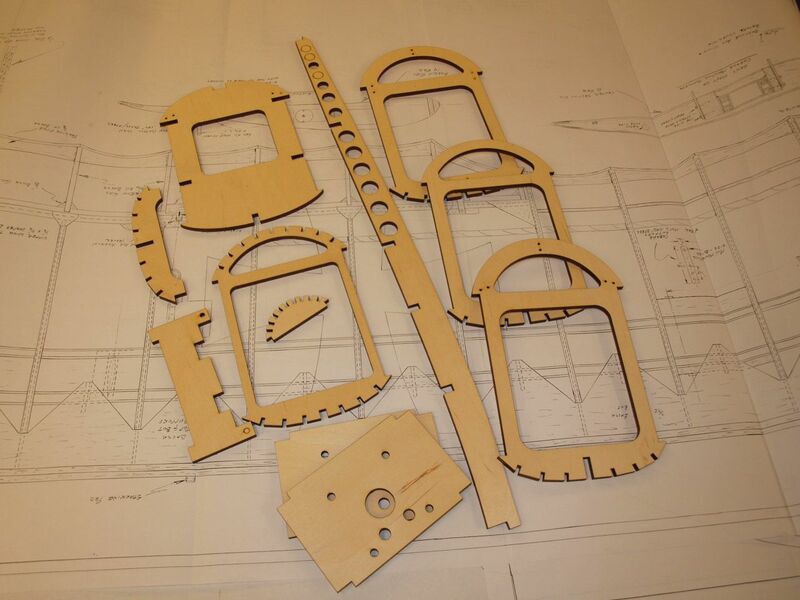 The laser cutting process cannot correct fit or accuracy issues caused by poor draftmanship or drawings. If you supply data which is incorrect we will faithfully reproduce that same error in the parts. The whole process is only as good as the data going in. Also we cannot resize a plan or file either, as this introduces errors and other issues which make for a unsatisfactory project. 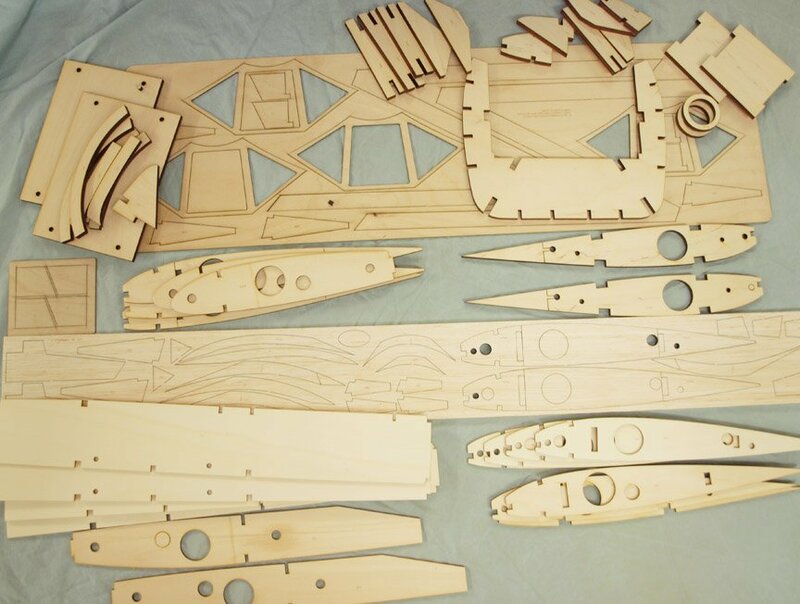 Laser cutting will however produce intricate parts that no other method can offer. Internal slots are perpendicular, unlike routering which leaves a radius in slots, such as spar and stringer slots. Lightening holes are cleanly cut, with no burrs. The surface finish of a laser cut part is smooth and requires no further preparation prior to use. 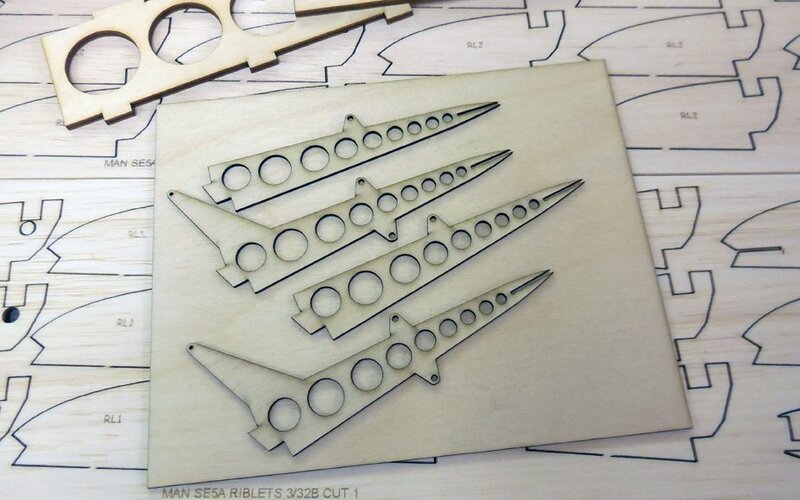 Lasers can cut balsa with a finesse no other proces can match and have the flexibility to cut tissue paper and then 3/4" plywood all with the same accuracy and quality. 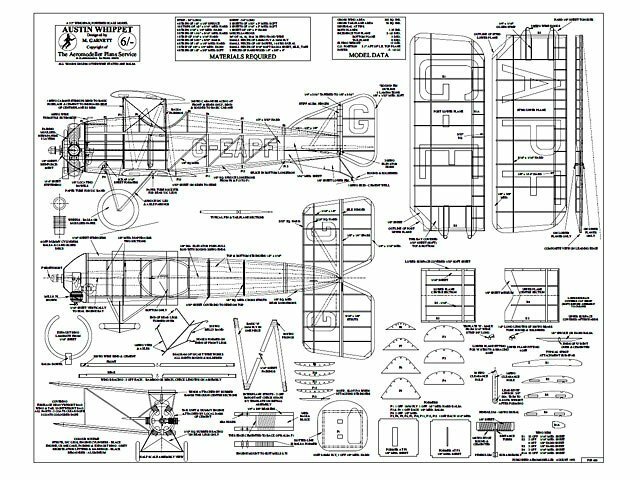 A Parts Set includes the shaped parts detailed on the plan - typically it would include fuselage sides, doublers, formers, bulkheads, wing ribs, stabiliser parts, tip shapes, dihedral braces, undercarriage mount. 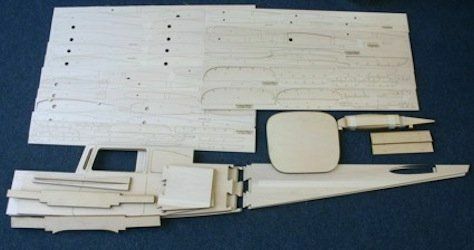 All parts are cut exactly as the plan and include all the time consuming slots and holes cut out. Most parts are laser etched with their part numbers for ease of identification. All balsa wood used is hand selected and graded for the part being cut. To complete the kit you will need to supply the sheet and stripwood. 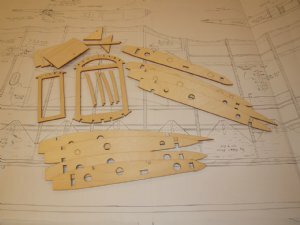 Plans are not included in the Parts Set and for most models can be purchased from us or directly from the designer. 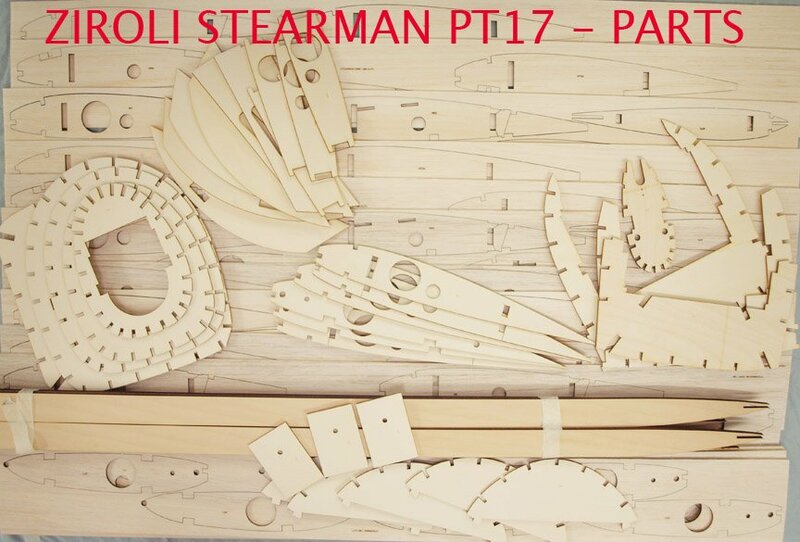 In the photo above are the contents of Hostetler's Cessna 182 Skylane parts and also the PT-17 Stearman by Ziroli. The amount of labour involved in cutting these out by hand would be enormous and a Belair Parts Set gets you building straightaway. 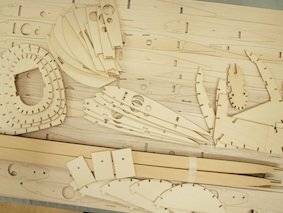 Plans or stripwood and covering are not included in our parts sets, however Belair do supply plans and accessories for most designs we cut. Stripwood is available from your local model supply company. Belair have some of the most powerful lasers in the country and unlike engraving style lasers that can only cut up to 1/8 inch plywood, our lasers can cut up to 3/4 inch birch plywood, 1 inch acrylic and balsa up to 1 inch. We can also cut acrylic sheet, hardwoods and also Depron in all popular sizes. Q: Why buy a Parts Set? As modellers we all enjoy building our model. 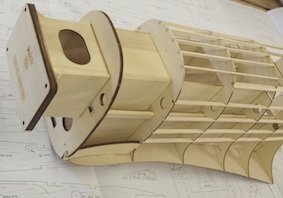 However, most of us do not enjoy or have the time to copy all the parts, transfer them to wood, cut them out, break blades and test patience before even starting the project. This is where a Belair Parts Set will release you from all that tedious work and allow you to start building straight away - the part you actuall enjoy. Combine this with the fact that the cost of a Parts Set includes all the wood you would have to have purchased anyway - normally the cost of wood is 50/60% of the cost of a Parts Set - they do represent great value and give you back your valuable time.